I’ll never forgot that day; its burned into my heart and soul and I am only a witness from afar…. It was such a beautiful morning….the sun was shining, the sky a beautiful blue, and there was just a touch of crisp-coolness in the air…. I was at my desk in Alexandria Virginia. CNN was up on my computer and I was on a phone call. Honestly, I saw the image of the plane slamming into the World Trade Center but the image on the screen simply didn’t register with my brain since I was so engrossed in the work-related call..It was just an image (a movie scenario perhaps?) …until… I heard my co-worker in the next cubicle say “A plane hit the Pentagon too?” At that moment it was if the world had stopped spinning on its axis….everything was silent…I could feel myself moving in slow motion. You see, until two weeks earlier, my husband worked at the Pentagon. He had just moved in an office at the Navy Annex across the street from the Pentagon but he still visited the Pentagon almost daily for meetings. I had no idea what his schedule was for that day. I tried calling multiple times but I couldn’t reach him as communications in the district and surrounding areas were cut off. My boss sent the office team home for the day; we were understandably shaken to the core. My heart was alternately seized with grief and panic as I drove the thirteen-mile distance home. There were already cars on the road with American flags flying in any manner that would attach to the vehicle. It was only 10:30 in the morning, less than two hours after the crashes; people were showing their feelings, their solidarity, in the best way they could as the horror in three different cities unfolded. When I got home I immediately turned on the television; I still had my bag on my shoulder as I stood inches away from the screen. I watched the images unfold in total disbelief, tears streaming down my face. The images of people falling or jumping out of the Twin Towers, screams of agony, cries of despair and disbelief, people running through walls of ash and smoke and streets covered with tremendous amounts of steel, brick, demolished cars, paper, glass and other debris. And the children….the stories of all the children…babies… lost in the collapse of the Towers. I just couldn’t control the tears. I also remember feeling angry that less than an hour after the attacks some in the news media and political pundits started the finger-pointing and blame game. As egregious as the events unfolding, I thought. I spent most of the day pacing back and forth in front of the T.V. unable to sit, unable to eat or drink…unable to process the images constantly streaming on television. I also remember instant messaging my husband’s sister for much of the afternoon. She lives in Pennsylvania where a third plane went down in flames as a result of the terror attack. She was safe but she too wanted to know if her brother–my husband–was safe. Each passing hour with no communication from my husband was almost more than I could bear; messaging his sister brought but little comfort to those hours…. Impossible. Impossible to comprehend…even to this day. 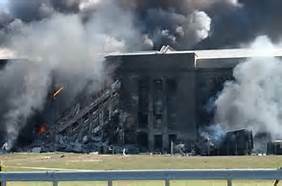 I didn’t hear from my husband until well after 4 p.m. His building had been on lock-down which prevented anyone from leaving the area. In fact, much of the city was in a gridlock. Naturally, when my husband walked in the door I was flooded with relief and more tears….and in the days that followed, by guilt. I had my husband at my side…he was there too through all the hours of anguish watching the news coverage. Not so for all the people who lost loved ones…they faced a lifetime of sorrow and despair. And those who survived…some with burns all over their bodies…some with lost limbs…lost eyes..lost minds…..
Ay……I cannot even imagine …..there are no words…just unbelievable sadness and a weight like a ton of bricks on my heart for all of the beautiful souls lost…and the tremendous pain left in the wake of the events. 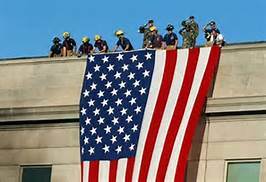 And when I saw, a week later, the enormous garrison American flag draped over the side of the ravaged Pentagon I was struck again (along with every other person I’m sure who saw it) with the knowledge that our world will never be the same again. Never. Just remembering twelves years ago, my heart literally locks up as if gripped by a metal vise; I open my mouth to speak but my voice is gone… there are just no words. I even tried to leave my husband a voice mail at work to tell him again how much I love him….my message gets garbled and I have to dial again…words tumbled out of my mouth as I tell him that I am remembering twelve years ago and I just didn’t want to let the morning go by without saying those three little words. So on this day again, my thoughts are with the all the families who lost their loved ones twelve years ago. This afternoon I sat on my yoga mat …closed my eyes…and just prayed. I may have family issues that are sincerely aggravating…I’ve got a list a mile long I can assure you…but nothing compared to the men, women and children that survived through the horror of Ground Zero, the Pentagon, and Shanksville, Pennsylvania….these survivors remain here on this earth without the people–our forever heroes— they hold so dear to their hearts. As I move through the rest of this day I continue to pray for peace in world that literally seems to be going to pieces. I hope that on this day, somehow, there can be a measure of peace for the 9/11 families knowing that this nation will never forget…. ← In My Next Life….